The images presented in this book take us into the heart of the rich folk tradition of India. Of that heritage, the display of paintings accompanied by comments recited or sung has been a part since very early times, as attested by references and legends in Sanskrit sources, including the Harsacarita, a 7th-century work by Banabhatta. Known as patacitras or patas in short, these illustrated narratives on rectangular fabric or paper as well as on scrolls are a type of performed art that reaches out to audiences, mostly rural, conveying the artists’ responses to legends and social themes of common knowledge across a wide range of audiences from varied social and cultural bases. A particularly powerful class of such paintings that come from the Bengali- speaking region of eastern India comprise the depiction of events from the Ramayana in the form of scrolls that are unrolled as the painter displays and explicates them. The vividly colourful images presented in this book occupy a special niche in the history of Indian art, remarkable because they are not only visual objects but narrative expositions of a text that has been part of the lives of vast numbers of the Indian people and often their source of moral guidance. 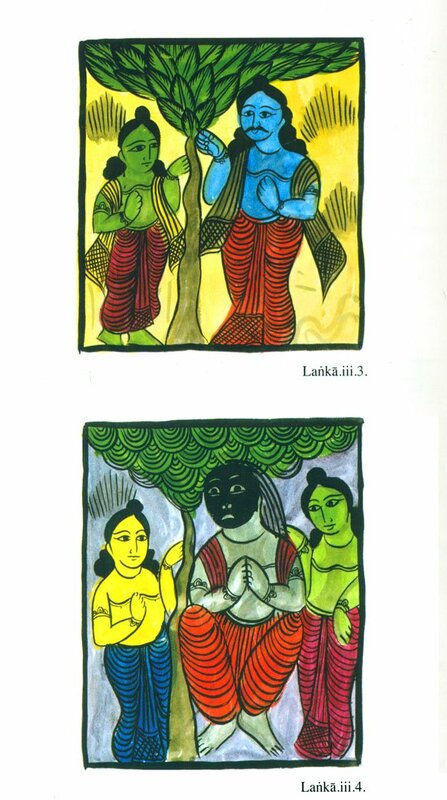 Especially remarkable is that these patas by Bengali folk painters diverge so often from the magisterial Ramayanas of adikavi (“First Poet”) Valmlki, leaving out important parts of it and importing into the Rama saga episodes from local narrative caches. Following conventions of both art and storytelling as they do, these portrayals constitute what is now recognised as the tradition of counter- Ramayanas that embodies alternative alignments of ethical judgment. Mandakranta Bose is Emeritus Professor and Director of the Centre for India and South Asia Research at the University of British Columbia, Vancouver. A Fellow of the Royal Asiatic Society of Great Britain and also of the Royal Society of Canada, Dr Bose holds a BA and MA in Sanskrit from Calcutta University, a second MA in Comparative Literature from the University of British Columbia, and the MLitt and DPhil degrees in Oriental Studies from Oxford. Her research over the past fifty plus years covers four main areas: Sanskrit treatises on the performing arts, the Ramayana, Hindu dharmasastras and religious culture, and gender representation in the arts and literatures of India. 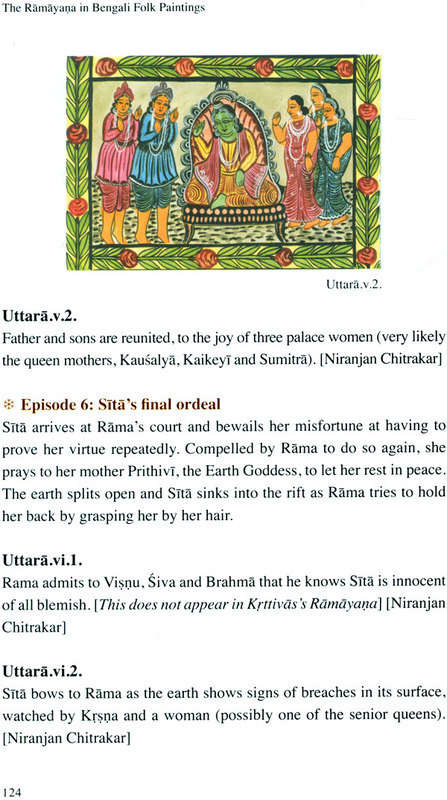 The Ramayana, without the evil maid Manthara who provoked Kaikeyi to demand that her son Bharata and not Rama become the next king of Ayodhya, would come to an abrupt end in the second chapter. Yet, we learn from Mandakranta Bose that this defining kanda has consistently been omitted from the Bengali folk artists’ version of the Ramayana, This seems shocking although there is nothing startling in learning of yet another version of the Ramayana. 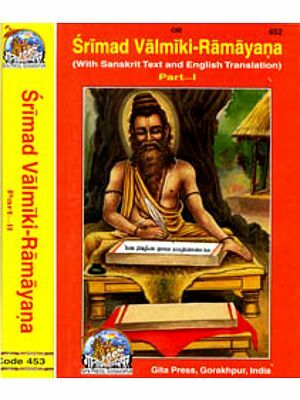 Valmiki’s Ramayana has been translated from Sanskrit into Indian languages and English, in its entirety and abbreviated form, and transcreated in a range of forms including stage dramas, TV serials, movies, short stories, novels, comics, and even a coloring book. Excluding versions of the Ramayana found in Cambodia, Thailand, Myanmar, Indonesia, and other countries of Southeast Asia - just a list of the languages A. K. Ramanujan wrote “makes one gasp”-there are still hundreds of versions. 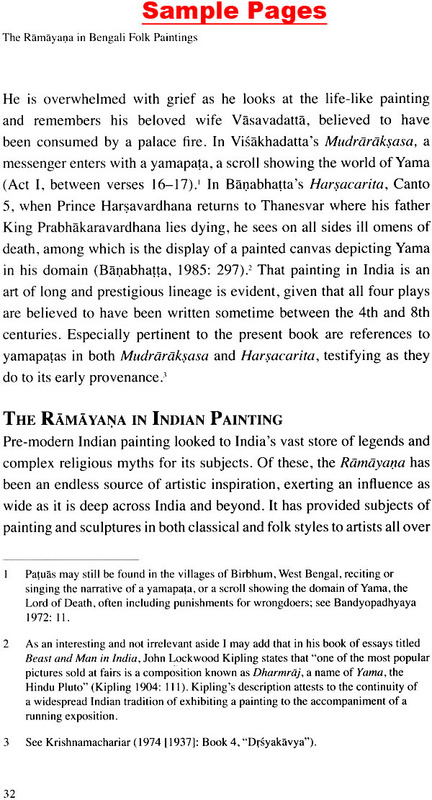 And, while many of these versions have been documented and studied, the Ramayana of the patuas of Bengal has not. A noted Sanskrit scholar, Mandakranta Bose is Professor Emerita at the Institute of Asian Research at the University of British Columbia and Director of the Institute’s Centre for India and South Asia Research. Well known for her writings on classical dance and the Ramayana, I am especially appreciative of Professor Bose’s work in women’s history: Faces of the Feminine in Ancient, Medieval and Modern India (Edited, 2000) and Women in the Hindu Tradition: Rules, Roles and Exceptions (2010), which are solidly based on texts and concerned with helping us understand women’s lived lives. Her most recent book, a translation of Candravati’s Ramayana, a sixteenth-century text titled A Woman’s Ramayana: Candravati’s Bengali Epic (2013), written with her daughter Sarika Priyadarshini Bose, contextualises a remarkable and gendered retelling of the epic. Always interested in the Ramayana, Bose first noticed scrolls by the Bengali patuas in the 1950s, returning to them in the 1980s to begin systematic and determined research on how they presented this story. This was when I first became interested in scroll paintings, attracted by their portrayal of social issues. Later, I was smitten by portrayals of Surpanakha telling Ravana of her humiliation, Jatayu’s struggle to save sita, and Angada’s meeting with Ravana. 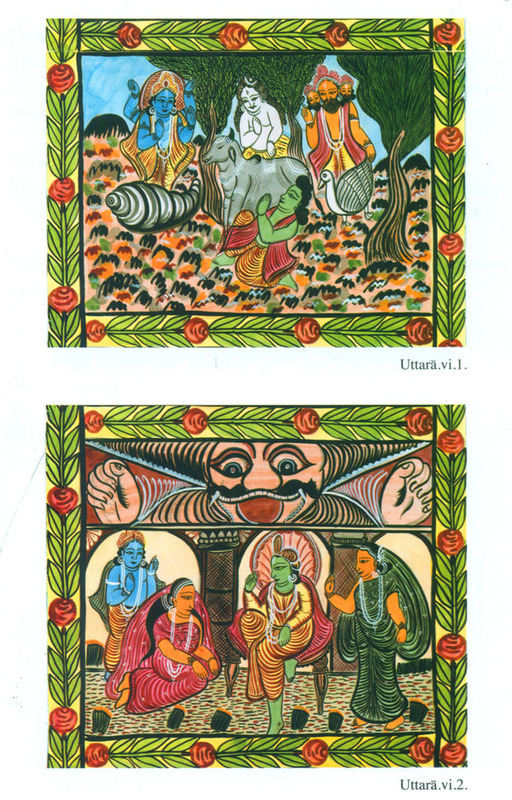 Bose’s The Ramayana in Bengali Folk Paintings provides the context in which to understand the patuas’ Ramayana, a distinct Bengali folk retelling of this ancient story. 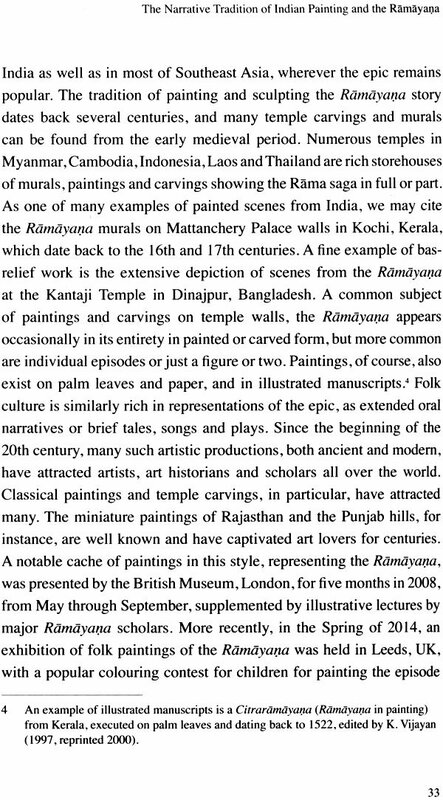 The history of the patuas or “chitrakars” (indigenous painters) of Bengal is difficult to write without acknowledging gaps in documentation. Most historians recognize ancient forms of storytelling with the aid of picture scrolls but have difficulty connecting twentieth- century patacitra artists to their ancient ancestors. David McCutchion and Suhrid Bhowmik cite the thirteenth-century Brahmavaivarta Purana as the first textual reference to these artists. McCutchion and Bhowmik refer to angry Brahmins declaring that the patuas’ “pictures and images were erroneous” and discrediting the community. Contemporary folk artists offer imaginative retellings of their origins. 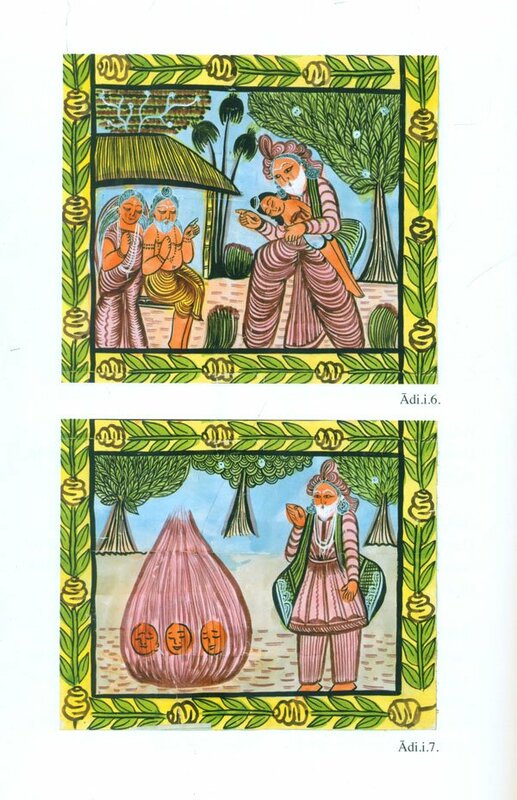 Frank Korom has related Gurupada’s story of how, two to three thousand years ago, some very clever villagers used a glass [mirror] to destroy a rapacious demon. They decided the best way to broadcast their victory would be to paint it and then travel from village to village telling and showing others what had happened. According to Gurupada, people paid them with food and coins but soon became bored with the demon story and asked for new tales. This was the beginning of patuas and patas. These three chapters form the background necessary to appreciate the patuas’ Ramayana presented in chapter 4. This is my favourite chapter as Bose presents the Ramayana as the patuas sing and paint it, using frames from different artists to tell the story. 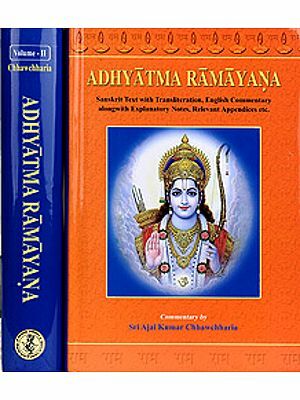 She persuasively argues that the Ramayana of the patuas is as vivid and nuanced as any other telling and deserves attention for its interesting and unique features. Certain events are left out and others are given prominence. 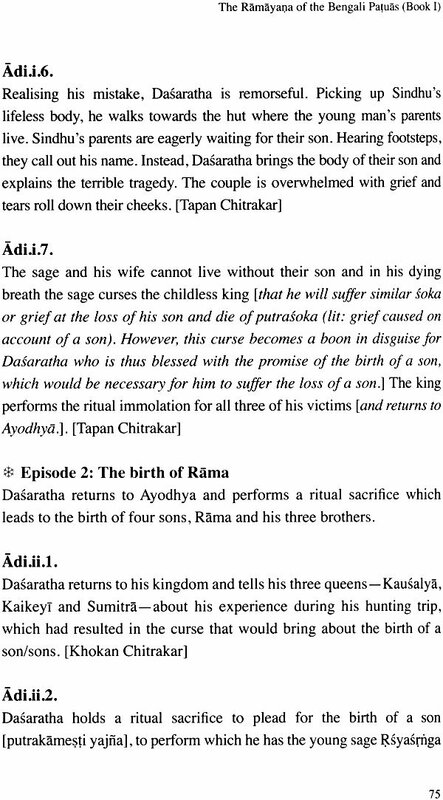 Similar to Candravati’s Ramayana, which she knows so well, Bose finds considerable attention to and sympathy for sita. She urges us to think about this departure from the written text and ponder whether it suggests something about the folk culture from which these scrolls emanated and found an audience. Although not specifically addressing gender, Mandakranta Bose raises fascinating questions about a folk culture that may have had a kinder, more sympathetic view of women’s plight than found in Valmiki’s and Krttivasa’s Ramayanas. By introduction to a unique type of folk painting of Bengal was through a colourful painted scroll depicting Sita’s abduction by Ravana and the mythical bird Jatayu’s struggle to death with him to rescue her. Painted with vegetable and other indigenous dyes in a vibrant and colourful style on handmade paper, it was a patacitra, a narrative painted sequentially on several frames. I was acquainted with the term pata but had never seen one before. 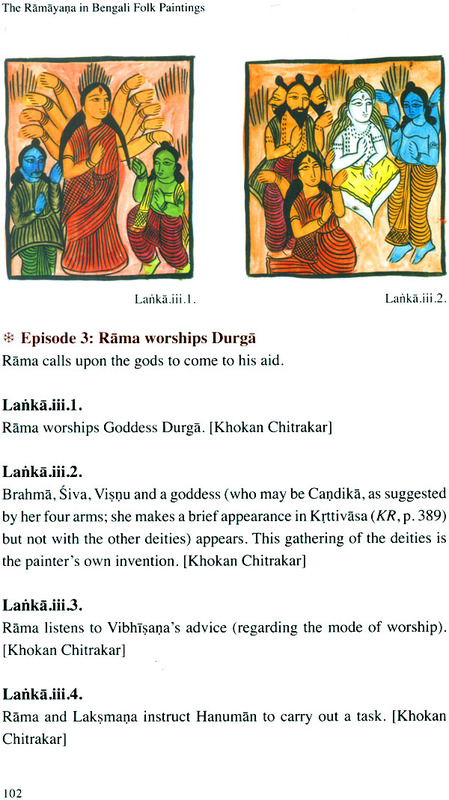 Although the painting depicted a well-known episode from the Ramayana, the abduction of Sita (Sitaharna), it looked very different from other folk paintings I knew, such as the Kalighat paintings of gods, goddesses, women, birds and animals. It was not done in the style of Jamini Roy either, which at that time, in the 1950s and 1960s, was very popular. I saw this unique piece at a friend’s home in Calcutta (now Kolkata) in the late 50s. This friend came from an old Kolkata family that had lived in Kolkata for over almost 300 years, since the city’s birth, and was well acquainted with the history and culture of the towns and villages of Bengal. It was the family’s long-established interest in Bengali folk paintings that led an ancestor of my friend to acquire the painting. The family had collections of many such artefacts not usually seen in other Bengali homes. I had not seen any other folk painting in that style anywhere else and could not learn more about the style at that time. Shortly after this encounter I went to England to study and returned to Kolkata a few years later, eventually moving with my family to Canada, which has now become my home in the West. However, Kolkata too has remained my home and I visit the city every year. But even through many visits to Kolkata I did not come across any other patacitra until the late 1980s when, to my surprise, I found that almost every academic friend of mine who was interested in India, especially in Bengal, possessed at least one such painting. Later, I gathered that, to our good fortune, this folk art had begun to draw serious interest from art collectors and academics alike just before it was about to sink into oblivion. The more I looked at these patas, the more I was drawn to them as much for their artistic form as for their narrative power. Particularly interested in the representation of the Ramayana in the arts of India, I began to collect patas, focusing on patas depicting Ramayana episodes and characters. The pages that follow comprise the result of my attempt to understand how this vibrant art form communicates the complexities of an ancient epic. The art of scroll painting goes a long way back in India’s cultural tradition. Found in many regional traditions, it has had a particularly rich history in eastern India, especially in parts of Bengal. However, the colonial era proved to be lean times for indigenous cultural forms, especially with the growing influence of art and literature derived from Western models and sensibilities. Yet the same sensibilities eventually came to evoke interest in India’s native traditions, leading to attempts at reviving them, including folk cultural traditions. By the early 20th century, both scholars and the general public had begun to take delight in rediscovering indigenous art forms, for example, the folk ballads of eastern Bengal indefatigably collected by Dinesh Chandra Sen, thereby saving them for posterity. The art of pata painting was the beneficiary of a similar redemption. The person who brought that about was Gurusaday Dutt, a civil servant, who collected a number of patas and other artefacts between 1929 and 1941 and founded a museum in Thakurpukur, a suburb of Kolkata, which has a rare and valuable collection of folk art. Though not widely seen by urban populations, patas did draw the attention of collectors and eventually found their way into museums. The Ashutosh Museum at Kolkata University is one such repository. Yet in the first part of the 20th century, the art of pata painting was by no means thriving. Despite the efforts of early pioneering lovers of folk culture, there was not much enthusiasm among the general public for the kind of art housed in these collections until much later. Many scholars who lamented the situation noted that the folk arts of India, among them the patas of Bengal, were becoming moribund (Bandyopadhyaya, 1972; McCutchion and Bhowmik, 1999). Later in the century, though, the tide began to turn. In the late 1950s and 1960s, British scholar David McCutchion drew attention to this folk art form and many academics became aware of its value. He taught Comparative Literature at Jadavpur University but he must be remembered more for his passion for temple terracotta sculptures and for these folk paintings, many of which he collected while carrying out research on the temple art of Bengal. Although there were a few scholars and art lovers from Bengal who had been collecting these paintings and were highly knowledgeable in Bengal’s folk art tradition, it would not be unfair to say that David McCutchion was greatly instrumental in bringing them back to the attention of Bengalis and to many foreign scholars at a crucial time when most of us were about to forget this art form and found little value in it. McCutchion’s curiosity and love for temple architecture and the folk arts of Bengal attracted many. Unfortunately, his untimely death in 1970, at the youthful age of 41 years, left many of his findings and thoughts unpublished. Later, some of his friends and colleagues published some of his writings but most of these publications are on English Literature and few on temple or folk art. What we do have of these published writings and letters on the subject give us valuable information. His demise brought to a definite end any possibility of his further contribution to the understanding of this art at that time. He had taken 20,000 pictures of Bengal temples and of folk art, most of which remain unpublished. Part of his collection of patas are in a museum in Coventry, England, where he was born, while his material on Bengal temples is in the Victoria and Albert Museum in London. His work in this field still remains unmatched. Fortunately, from the late 1970s onwards there has been a growing demand for patas, and many researchers have been collecting these paintings. This is not exclusively or even mainly an academic venture; art lovers from all walks of life have contributed to the revival of this genre of folk paintings of Bengal. Several cultural groups, such as the Crafts Council of West Bengal and the Daricha Foundation, have taken on the task of preserving and promoting the art of the patuas and their livelihood; while an yearly festival of patacitras at Naya and Pingla villages in the Medinipur district of West Bengal has become a prized tourist destination. On one of my trips back to Kolkata in the 1990s, I spoke about these painters and their paintings to my niece Tapati Guha Thakurta, noted art historian, who introduced me to several folk painters and their paintings. This was my introduction to the gold mine from which I have drawn material for the present volume. Having collected a number of painted scrolls, I became curious about their history and began to enquire about the origin and development of the painters as a community, their art form, their lives and their versions of the Ramayana story. I tried to understand the beauty of their art that has attracted so many from different walks of life. I was aware that folk paintings often resemble both classical and folk art forms, and that examples of such hybridity can be found in every corner of India. Also, a large number of both kinds of paintings focus on stories from the epics and various myths and legends of India, shaped in both form and content by their own regional versions. Yet, it is also true that all folk arts have their distinctive styles, particular to the specific region of the Indian subcontinent from which they come. With the recent rise in enthusiasm and interest in cultural tourism and encouragement from the government, folk arts all over India are doing remarkably well and we are now exposed to a great variety of such art forms. Various folk arts have become more and more accessible to everyone to enjoy and appreciate. As I continued to collect patas and to think more searchingly about them, I began to wonder what it was that drew so many people-the painters themselves, their patrons, and academics-to cherish patas. How is it that these paintings continue to thrive? Is it their aesthetic power or do they have some special social, economic or religious appeal? And how has their distinct character evolved from ancient times to the present? A historical enquiry was clearly my first task.